Heat oven to 375°F. Spray 24 mini muffin cups with cooking spray. Carefully press 1 wonton skin into each cup (wrapper will extend above rim); spray lightly with cooking spray. Bake 8 to 10 minutes or until lightly browned and crisp. Remove from cups to cooling rack; cool completely. Meanwhile, in medium bowl, mix peanut butter, water, lime juice, vinegar, honey, chili puree and sesame oil with whisk until blended. Add almonds, onions and chicken; toss to coat. 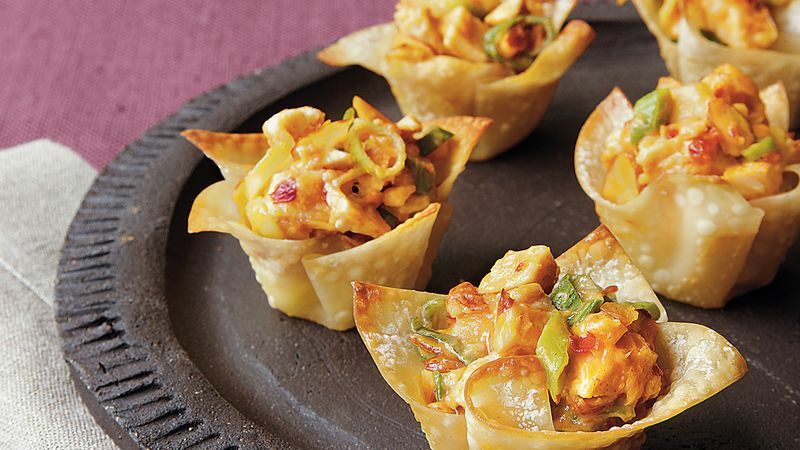 Just before serving, fill wonton cups evenly with cabbage (about 1 teaspoon) and chicken mixture (about 2 1/2 teaspoons). To toast almonds, spread in ungreased shallow pan. Bake uncovered at 350°F 6 to 10 minutes, stirring occasionally, until golden brown.